I’ve been thinking of putting one together recently. I have a Makerbot I can use at my hackerspace. But I’d like to have one at the house. 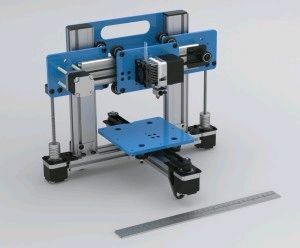 So shopping around I decided to go with the Ord Bot platform, Automation Technologies sells a good kit for the base platform but it’s missing some things like the extruder/electronics/bed. I ordered that. Just got my shipping notice. The dual z seems to be pretty common nowadays, if you look at the mendel90 or Even the mendelmax they both have 2 motors. I guess it allows for a more stable z. I did read about this platform having a little z wobble, but it seems related to how the extruder is mounted.